I don't know who's pitchingin yet. Stats count for regular season, so a 2 run HR gets Yelich a form of a Triple Crown. Just remember, " good pitchin' beats good hittin' and vice versa!" "Big time players make big time plays in big games." Who will become immortal today? Enjoy today, its unlikely you'll ever see this again. Second biggest regular season game in Brewers history only behind the final game of 1982 which was a win or go home game. Jose Quintana in 10 career starts against the Brewers is 6-2 with an ERA of 1.60. If the Brewers start Jhoulys Chacin, he has an ERA of 1.57 against the Cubs in 4 starts this year. Bottom line on that is that runs will be at a premium. The Brewers bullpen is far and away better than the Cubs so that is a huge advantage in a close game. The Cubs are the one team that has held Christian Yelich down this season as he is only 10 for 57(.175) with no home runs and only 5 batted in against them. I will be interested to see what the Brewers do with Travis Shaw today. He has not been very good against left handed pitchers this year. He has only 2 home runs against them and a has a slash line of .211/.305/.298 this year. There are a lot of left handed starters on the teams in the post season this year. I hope they don't plan on sitting him most of the time. Last series against the Cubs, Maddon left his left handed pitchers in to face Perez and Schoop to avoid letting Shaw come in off the bench to face a right handed reliever. Unfortunately the expanded rosters are still in play today which will make for a nearly four game. That rule needs to go away for September games. If the Cubs lose, they have Lester for the wild card game. If the Brewers lose, who knows who will pitch that game right now. It feels like sectionals for baseball right now, when do you throw your best pitcher? Tough decision for the Brewers. As of 8:00 am the Brewers have not officially announced their starter. [QUOTE username=roadkill1 userid=5673812 postid=1305671136]As of 8:00 am the Brewers have not officially announced their starter. 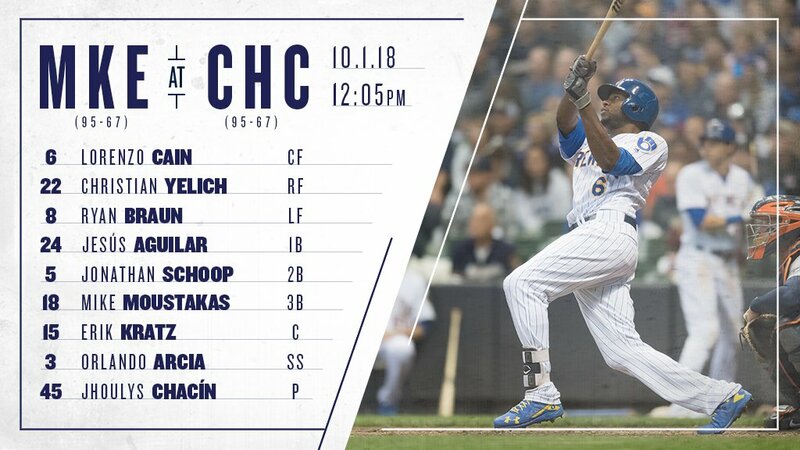 I think the Brewers will go with Chacin today and hope they can get 4-5 innings out of him(to my knowledge Chacin hasnt thrown since last Wed. If they win, then Miley goes on Thurs. Probably throw Anderson tomorrow and try to get 3-4 innings out of him if they lose today. I dont see them using Miley before Thurs, but I guess it is possible with the 3 inning short start this past Sat, the Brewers could throw Miley out there on Tues, should they win today. Dont think Davies is in the picture, but one never knows. I think Anderson starts today. No Shaw in the lineup, and surprisingly no Perez either despite Perez having good numbers (.320 BA in 25 at-bats) for his career against Quintana. Shows me a couple things. #1-They are all in today! #2-They have faith in Miley if they play tomorrow. My call on Anderson was just a hunch. He is capable of a big game. Cain-Arcia and Schoop-Kratz up the middle. 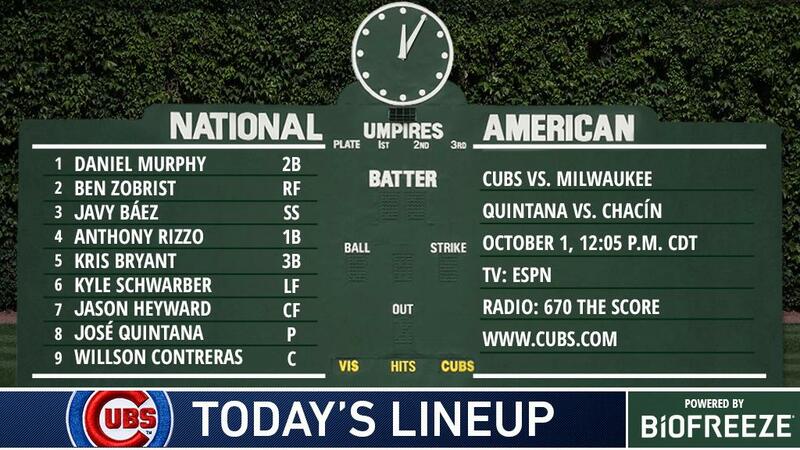 If Chacin has success against the Cubs #1 through #4 today, it should go a LONG way towards a Brewers victory. This is such an awkward situation for teams. Play to win today and possibly have no one in the BP for tomorrow in a win or go home game or play it safe today and be ready to win a playoff game tomorrow. Feels like the MLB should adjust the schedule based on having at least 1 off day before a playoff game. Brewers have to go into this with all possible contingencies on the table. Fall behind early and we may see Anderson to eat innings and save the BP. Get a lead early and we may see 15 pitching changes today. Much will depend upon how the game plays out. Need some offense early today. I would plan for Miley tomorrow with Woodruff or Burnes behind him as L/R change over and that should get me into the 5th. Who is your pick for star of the game today? I'm picking Schoop and Jeffress. Plus I wouldn't be surprised to see Arcia hit 1 out today.